Hi everyone. This review has long been overdue, so I am so happy to finally share it with you. Lhey Bella, the owner and creative director or Mommy Lhey Designs, generously sent over some products for me to share with you. 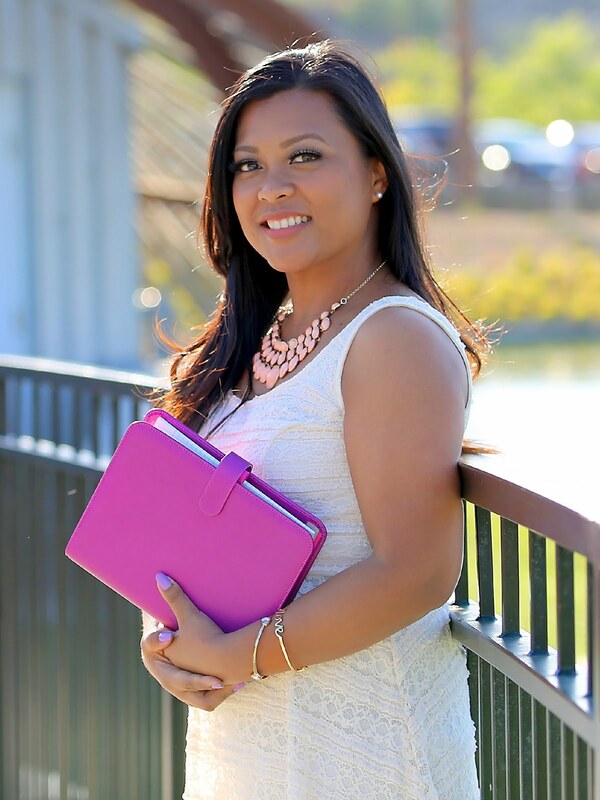 Lhey Bella is not only talented singer and performer, she also is known for her for beautiful digital creations such as themes for your phone, custom logo designs, business cards, invitations, and more. Her gorgeous lettering and modern calligraphy is captivating! Most of us planner people know her for her kawaii "cute" stamps and stickers. Since opening her shop this year, she has released over 15 stamp sets, which she says, "is a mix of cuteness and sass, anything and everything cute and classy." The first set is called, "My Daily Kawaii Stamp Set" and the second is, "My Daily Kawaii V2". All stamps are clear polymer, non-yellowing, high quality. I am a big fan of her kawaii style designs. With her first few sets, I felt that the images were bigger than I would have liked them to be. The phrases and words were also larger than I would have liked, but I really fell in love with the handwritten look to them. Since then, they have improved and gotten better and better. Here I've used a combination of her April Release. The "Tag You’re It" Planner Stamps fit great as headings for the Erin Condren Life Planner. The Fancy Frames can also fit into the boxes of the Erin Condren. They are also great to add some sass to those plain, boring sticky/post-it notes. The "My Doodled Day" stamp set includes 37 kawaii doodles which include this cute coffee/tea mug. I think Mommy Lhey listened to what her customers wanted and made these icons smaller than her first released stamps. The "Polka Planner Stamps" are unlike anything I've seen before. Again, these words/sentiments fit perfectly into the Erin Condren squares. She also created some round stamps which are the just the right size to stamp onto stickers as well, again featuring her wonderful lettering. One thing I like is that you can use the smaller round stamps into the banner which is in the "Tag You're It" set. (example in photo above). In this photo, I used the "Busy Queen Bee" set to create some stickers for reoccurring tasks, such as my daughter's dance practice. They are the perfect size for my Webster's Pages Color Crush Planner monthly inserts. This set is also great for meal planning, and all those things you can think of that relate to your children, work, and home. These stamps will work with most planners. I think they would take up too much space if you wanted to use them with a pocket or smaller sized inserts. 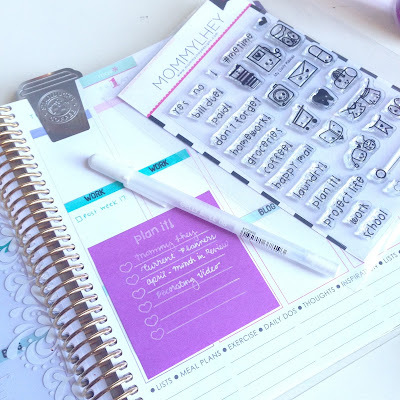 If you are afraid to directly stamp into your planner inserts, I would suggest stamping onto white labels. Overall, there are many uses for these stamps. 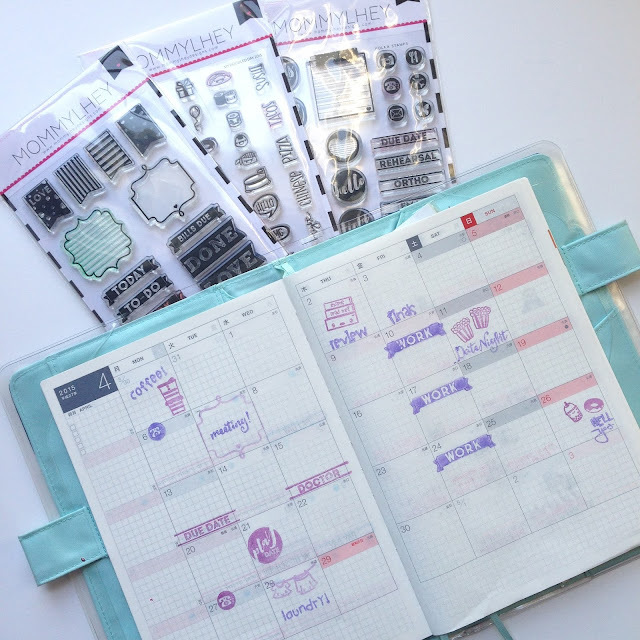 They work great with journaling, card making, project life, as well as in your planner. All the sets go for $15.00 USD. I think this is a reasonably priced, since most 4x6 planner stamp sets are also sold for a similar price. I am very happy with these stamps. 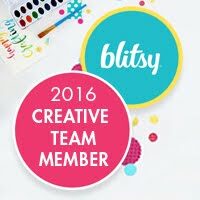 They are unique and are one of the very first kawaii stamp sets made for the planner community. Every now and then they do go on sale, which is always a plus in my book. After getting to know Mommy Lhey personally, I am happy to help support a fellow Filipino (people who identify with the country of Philippines). Also visit her on Facebook, Twitter, Instagram, and YouTube! **This week, select stamps are on SALE now!!! Use code "thankyou10" for 10% off your order! *This post is brought to you in collaboration with Mommy Lhey Designs and does not contain affiliated links. All content, ideas, and words are 100% my own, unless otherwise stated. Thank you for supporting the sponsors that allow me to showcase these wonderful products.